3.5 stars. This was a hard book to read in parts, but I can't say that I was surprised by the fact. To start, I was not fond of the constant writing style shift (therapy sessions retold in second person, then first person, with flashbacks from the time before the kidnapping mixed in), but after a while it wasn't as big of a deal.I can honestly say that Still Missing would make an interesting movie. In fact, I think in many ways, that it would translate better to film than it does in print. There are certain subtleties that film would really capture.Did I cry? No. Did I feel guilty for not crying? Sort of! There were a few gut wrenching moments that should have made me cry, had I not read several other emotional books recently. 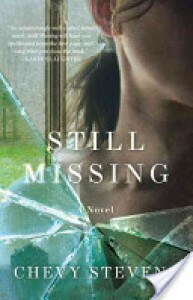 By the time I made it to Still Missing I think I was too emotionally spent to find myself as invested as I might have been during a different place and time. Even so, there was definitely one scene that had my stomach churning with sadness and anxiety. The story itself was an interesting take on imprisonment. The victim never fully gave herself over to Stockholm Syndrome, and in this particular instance I was glad. The kidnapper was such a disturbed monster that I didn't want Annie to feel any fondness for him. Part of me wants to go a full 4 stars on this book for the amount of time and detail that the author put into this book. I can only imagine how much this woman had to immerse herself into the world of the victim in order to capture the feeling completely. I was also a bit surprised at the twist that came with the last few sessions. I didn't expect there to be a conspiracy aspect to the book - not at all. But, for me, the story would have been better told in real time with a few minimal flashbacks to tie a few things together. The therapy sessions took me out of the story every time the writing switched to second person. Therefore, the rating stays a 3 star with a 3.5 notation.